And our jar? 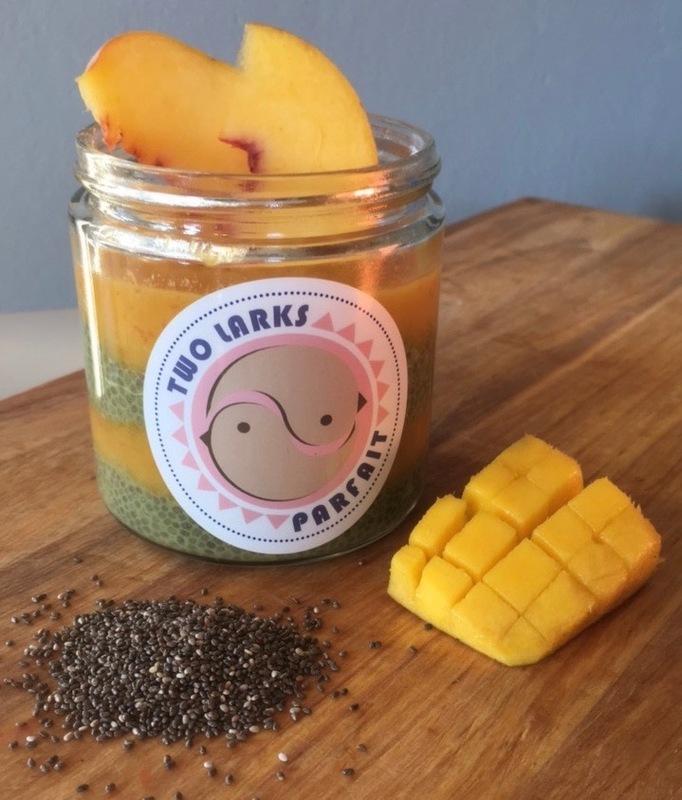 Reusable glass – because Two Larks Chia also believes in honoring our planet. We want to do “our part”. We are on a mission to help our retailers educate consumers to reduce waste and give them the opportunity to do their part. 70% of our jars are re-loved, on average. 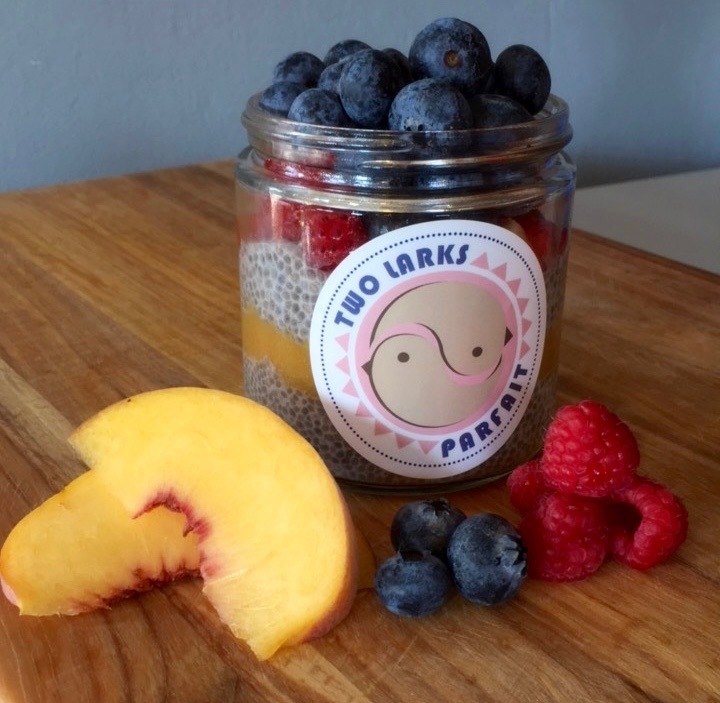 Women-owned and operated, Two Larks Chia is proud to be a Salt Lake City, craft-food producer. The social movement towards the artisanal, hands-on, small batch food ensures a fresh and thoughtful product – which is something we value. 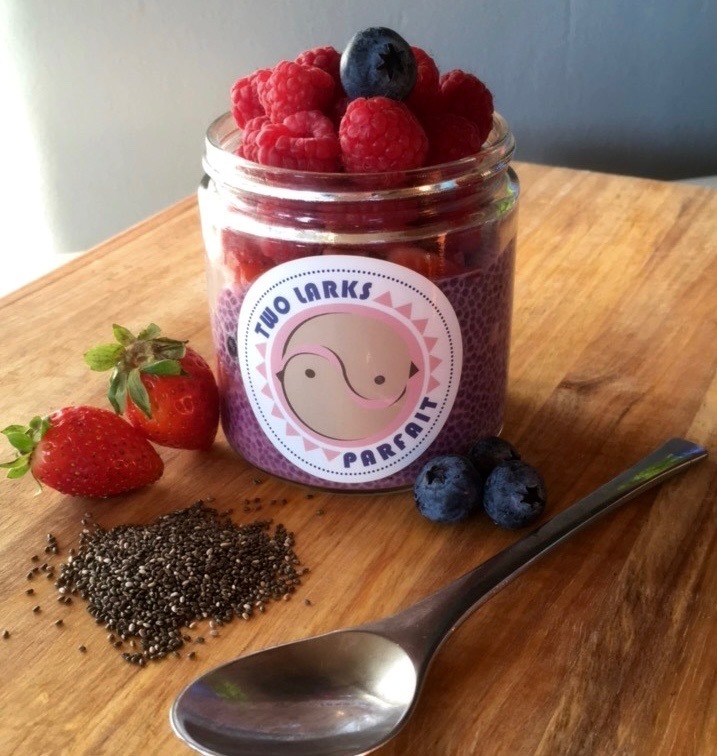 Two Larks Chia currently boasts 7 delicious and diverse flavors: Vanilla, Chocolate, Neapolitan, Matcha, Pink Pitaya, Chai, and Mocha. Each is paired with complimentary fruit, making it look almost as good as it tastes. You can currently find us at the Rio Grande Depot for the 2018-19 Winter Market, after having spent the summer at the Downtown Farmer’s Market in Pioneer Park. So much delicious goodness in a little jar. Perfect texture, not too sweet, but oh so delish. These Larks have knocked it out of the park. Super tasty, healthy serving size. A perfect breakfast! Perfect breakfast food! I love this parfait! It gets me through the morning! A vegan daughter, a Hawaiian vacation and some magic in the kitchen. This is how Two Larks Parfait began. 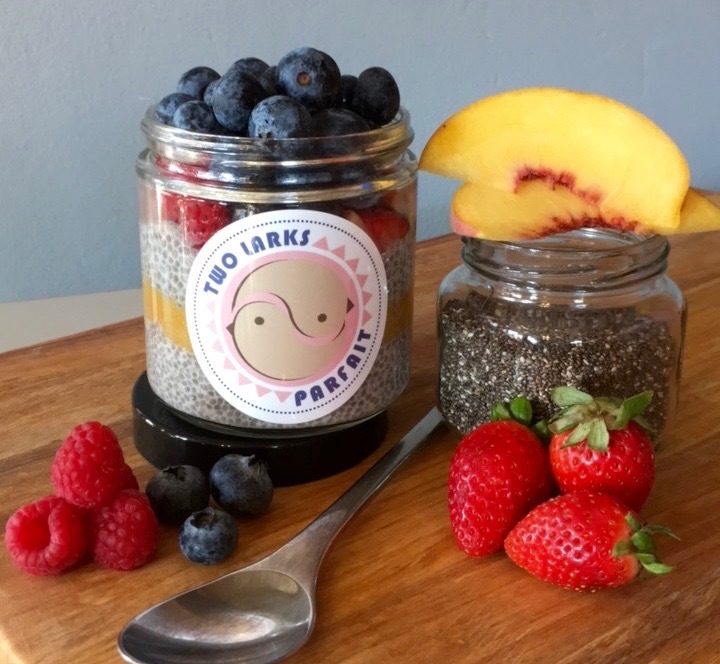 Maureen, our fearless leader, wanted to create a nutritious, delicious, vegan, and gluten-free, meal for her vegan daughter and after enjoying a chia parfait in Hawaii, she decided that chia was the answer. For months she experimented with the magic chia seed and finally created our first chia flavor. We call it our classic and classic it is – vanilla, layered with pureed fresh strawberries, figs and hemp-hearts and topped with fresh berries. Two Larks, LLC was formed in March 2018 when Maureen approached Phoenix for some moral support and artistic flair. Kelly came on board a few months later in May to cover sales and technology and we have been celebrating local success at the Downtown Farmer’s Market since June. 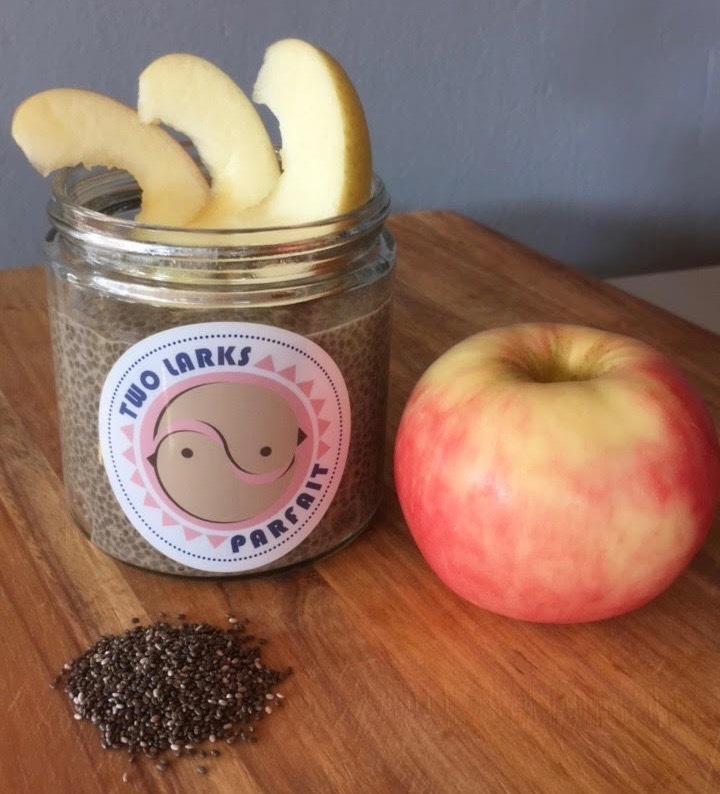 This entry was posted in Food and tagged Chia Pudding, Chia Seed, gluten free, vegan on December 5, 2018 .